Our brochure holders and literature display systems are in use all over North America by a massive number of different industries! We have supplied major financial institutions for years! From simple business card holders to large multi-tier displays, our robust and elegant brochure holders stand up to heavy customer volume in the banking industry. Use our holders on a teller’s counter, information kiosk, ATM, in a financial advisor’s office, or elsewhere! From big box to smaller retailers, our brochure holders are perfect for retail! With high customer volume and heavy equipment, department stores rely on brochure holders that can withstand their busy environment. Use our display systems at check-out, on display boards, and more! When an organization relies on donations and local support, it is crucial to convey your story. 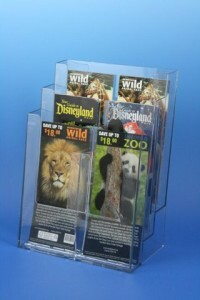 Our inexpensive and tough brochure holders display your message clearly and professionally. Accessible and organized literature is an essential part of the educational system. We understand budget limitations and buying direct from us, the manufacturer, saves you the most! Information is vital in health care, and so is a clutter-free workspace. Organize your brochures, leaflets, and more with our versatile holders! Ensure your products, services, and patient information is properly conveyed. Your clients and potential clients will appreciate a professional display that combines feature sheets and business cards! 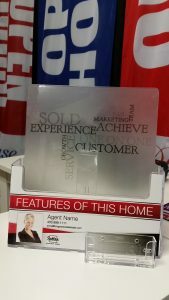 Solidify your commitment as a realtor with a neatly displayed counter or table-top holder. Take-out menus, daily specials, and gift cards are all an important part of your business! Display your literature in our holders to catch the attention of your customers. Show your customers the services you offer, from taxi services to local attraction info to banquet rooms! Our literature holders are the best way to display information at your hotel, inn, or similar business. Brochures and literature tell your story! Tourists rely on brochures to decide what to do and where to go. Make sure your message stands out and is easily accessible with our versatile holders! The most inexpensive part of your trade show booth could be the most important! Flat literature is a waste of space and can’t be viewed properly from a distance. Elevate your booth with our brochure holders!